At Home Network, 2019. 04. 05. The Mercer Study has chosen Vienna as the world’s number one most liveable city for the 10th time in a row. Let’s see some details of this survey! what is the mercer survey? Each year, Mercer's Quality of Living rankings analysed more than 450 cities globally and evaluated 231 at the end. It uses a 39- factor criteria-system, such as the city’s infrastructure, education, culture, health care, socio-political environment and crime rates. They also analysed the recreational offers, not to mention the housing market. Once again in 2019, Vienna was worthy to come out on top in the study. what is so special about vienna? To rank 1st on a prominent survey like Mercer's it is not easy for 10 consecutive years. This means that the quality of life and opportunities are constant and growing in the Austrian capital. Vienna is famed for its coffee-house culture, world-renowned museums, and imperial palaces. Mercer says the city also has world-class standards when it comes to areas such as recreation and availability of consumer goods. Ask anyone who lives here and you’ll learn that Vienna has a lot going for it — the people here are friendly, it’s clean, it’s safe and it has a strong economy, just to name a few perks. How the toplist comes together in 2019? This year eight Western European cities join the top ten, even when "trade tensions and populist undercurrents continue to dominate the global economic climate", as Mercer points out in its report. 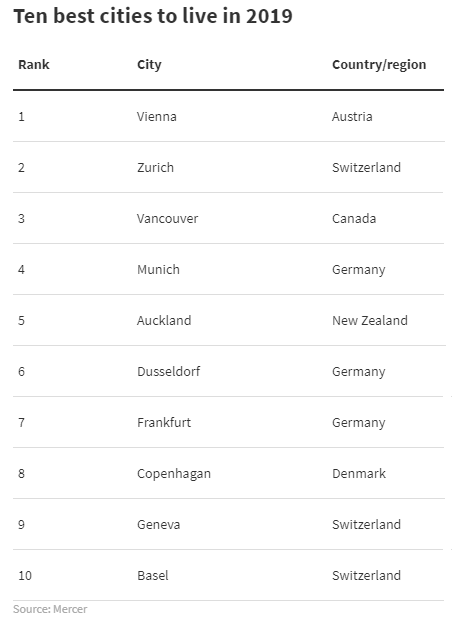 Zurich ranked in 2nd, Vancouver in 3rd, Munich in 4th and Auckland in 5th. These 5 top rankers have not changed in the last 5 years. According to Mercer, a lot of German cities performed well in its rankings. For example Munich (4. ), Dusseldorf (6.) and Frankfurt (7.). In United Kingdom we see London (41.-tie), Edinburgh (45. ), Glasgow (48. ), and Birmingham (49.-tie). The most liveable cities in Central East Europe (besides Vienna) to our liking are Prague (69.) Budapest (76. ), and Bratislava (80. ), in North America are Vancouver, Toronto and Ottawa. From other regions cities that performed well are Auckland, Wellington, Melbourne, Sydney and Singapore (top rated Asian city). A top scorer for 10 years in a row couldn't fail you! If this city attracted you, then you will find a wide variety of apartments on our homepage, for rent or for sale each of them is very unique and offers you to stay much more longer, than you planned. Maybe for the next 10 years.